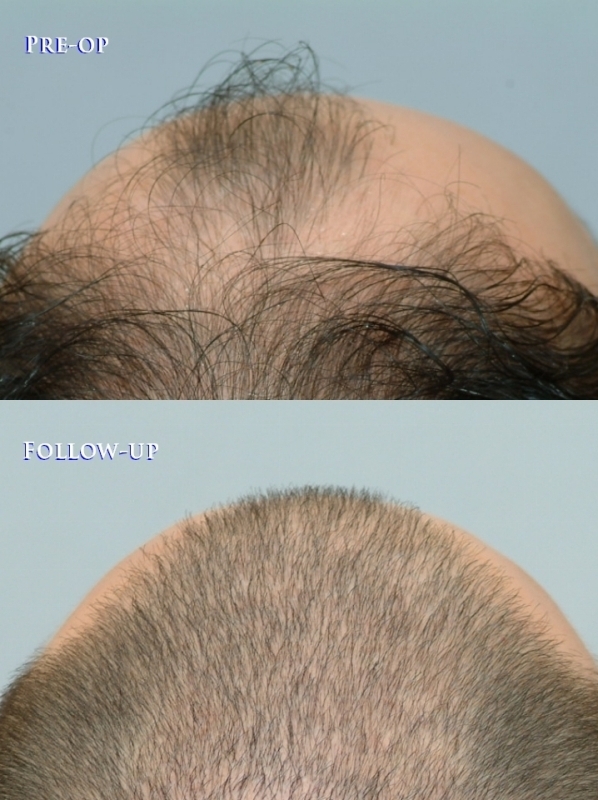 Below are pre-op and post-op photo comparisons depicting 24 month results of a class 4 potential class 5 patient who desired an overall thicker front via CIT (Cole Isolation Technique), a non-strip hair transplant method. The patient has medium fine, wavy hair and slightly above average donor density of about 200 hairs per square centimeter with 180 hairs/cm2 being about the average. Dr. Cole’s treatment plan was to strategically transfer about 2500 CIT grafts to the front in order to minimize shock loss. Shock loss is usually a temporary condition that occurs when pre-existing hair is shed due to trauma from newly transplanted follicles. For many patients, shock loss is catastrophic and can cause significant inconvenience for at least a couple of months after a hair restoration procedure. We prefer to perform CIT on all patients as it provides them with an average of 2.9 hairs per graft and a transection rate of 0% to 2%. More hair per graft can exponentially benefit patients who have higher degrees of hair loss. The process effectively utilizes scalp donor resources by allowing harvested grafts to be transplanted intact without being fractionated. The procedure affords the physician the ability to selectively choose every donor follicular unit to ensure the best follicles are harvested to successfully complete the restoration procedure. Patients seeking strip should understand that they could be paying multiple times for a significant number of their donor follicular units. The coverage value of each follicular unit affects the end result. If a photo is worth a thousand words, these photos say it all. Finally, the patient’s self-conscience behavior has turned into self-confidence and the new appearance is remarkable. Here is another successfully treated patient who has also avoided the linear scar of strip method. Very natural work, no signs of hair transplant at all but I think he can use more hair in the front, don’t you think? » use more hair in the front, don’t you think? Ditto, I don’t mind seeing more results like this one, just barely enough grafts to make a difference without breaking the bank. This looks great, much more natural than the low, straight hairlines you often see on this forum. Looks quite undetectable in my humble opnion. I particularly like the fact that there is some recession in the temples, which looks normal on a man - especially as he ages. Lately, I have seen so many hairlines on the site that look like a Ken doll or a Thunderbird puppet. Just because modern FUE techniques make it possible to recreate an 16 year old hairline, does not mean one should. And of course, there is the ongoing problem on keeping it up as the available donor hair is used up. » » use more hair in the front, don’t you think? » grafts to make a difference without breaking the bank. Also, even if he loses all his hair one day, still no harm done, there is no strip scar and he still looks natural with no signs of having hair transplant done. CIT how many do you think he (class 4) can spare for future procedures after this 2500 grafts? Got pics of the back of his head? Fabulous coverage and undetectable. CIT, why is his head shaved even 2yrs later? He could have shaved prior to getting a hair transplant as well. Any chance there are pictures with hair grown out? » couple of months after a hair restoration procedure. » value of each follicular unit affects the end result. » patient who has also avoided the linear scar of strip method. In the post op pic I can see work was done on his crown. Why no after pics of the crown? » after this 2500 grafts? Got pics of the back of his head? After about 2500 grafts, the patient has about 5k grafts remaining in the donor area. Low hair lines can eventually hurt patients with higher classes of hair loss because a significant amount of grafts must be used to establish lower hair lines. Overtaxing the donor area can really be a problem if thin spots (gaps) form on the scalp from additional hair loss. It compromises the whole aesthetic result if the patient can’t fill in these areas. Proper donor management is key until hair multiplication shows good results in humans. Once the finite source is exhausted, we rely on body hair. Body hair can be good in certain applications, but we don’t prefer to use it if scalp hair is available. Body hair is much less predictable than scalp hair. Starting off and ending with a minimally invasive procedure (CIT) will allow patients to wear shorter hairstyles until the end. » » after this 2500 grafts? Got pics of the back of his head? » problem if thin spots (gaps) form on the scalp from additional hair loss. Hi CIT, you should post more work like this. Just barely enough to make a nice difference in appearance without overtaxing the donor like you said. » chance there are pictures with hair grown out? » » » after this 2500 grafts? Got pics of the back of his head? » » until the end. » nice difference in appearance without overtaxing the donor like you said. It’s absolutely priceless not having to worry about overtaxing the donor area or a strip (FUT) scar. You could spend several thousands on a procedure, but you may not need as many grafts as you think. 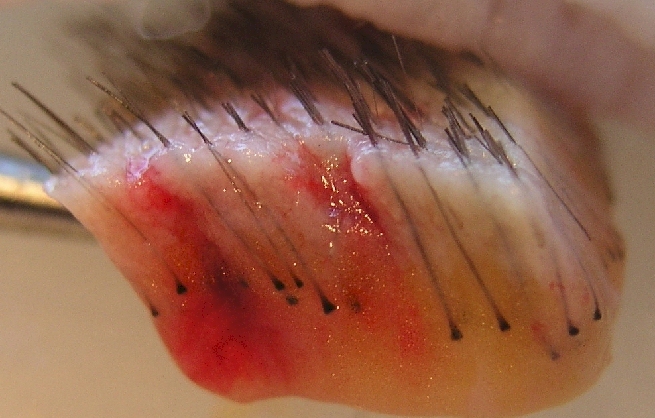 On average, the CIT technique actually produces 2.9 hairs per graft. This amount of hair lowers the amount of grafts needed and makes the pricing of CIT more competitive than you think. Basically, it’s like paying average strip pricing for CIT (non-strip procedure) or FUE (non-strip procedure). The best aspect of the CIT method is not only that it allows the doctor to move more at at once, but that it doesn’t result in a linear scar in the donor area (back of the head) and is extremely efficient in donor harvesting (transection rate of 0% to 2%). Transection is trauma done to any follicle that permanently disables it from growing hair. Many patients are not aware that techniques & physicians transection rates. Some FUE clinics will give patients a calculated transection rate before their procedure and even fewer can provide supporting data. For example, when a physician harvests a strip, the initial incisions made by scalpel make it very close to impossible for there to be no transection of surrounding follicular units. This transection of precious follicles is not publicly discussed or documented. The transection done by a strip physician’s medical assistant(s) is usually not accurately documented at most clinics so the patient’s follicles fall subject to the assistants’ morals and integrity. 1: Transection rates by strip are a lot easier to control since it is performed by direct vision rather than the blind protocol of fue. 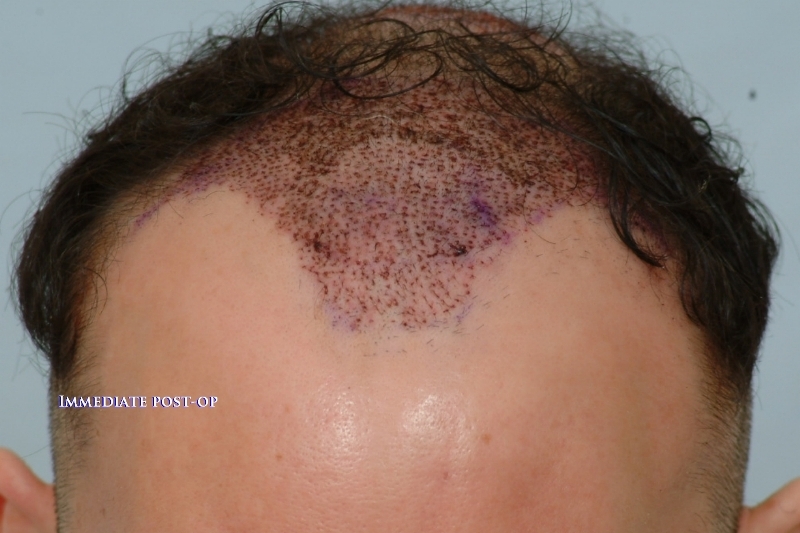 2: The transection of surrounding follicles in the donor area is more problematic with FUE. 4: Apart from your word, what is the evidence that you have a lower transection rate than any other FUE clinic? » performed by direct vision rather than the blind protocol of fue. » transection rate than any other FUE clinic? That’s the problem with transection. We all know that it exists but nobody know how bad it really is from one doctor to the next. 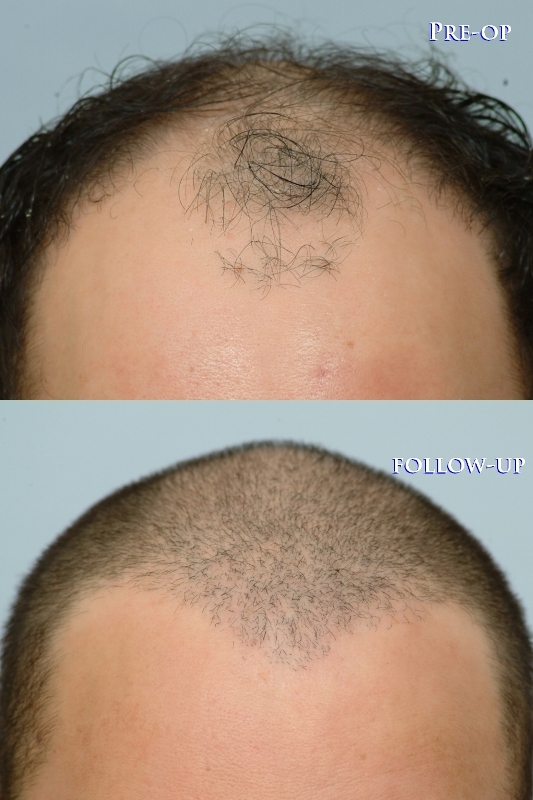 If there is transection in the donor site you will know because all the surrounding follicles will fall out soon after your hair transplant surgery. That’s a damn good hair transplant. The only way to know for sure is to perform a biopsy. Unfortunately, that is usually not practical. Below is a photo taken by Dr. Cole & Dr. Rose several years ago. It provides an excellent view of what’s happening underneath the skin.